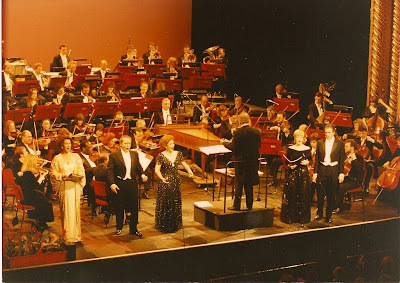 This "action" photo was taken at the Australian Musical Association's concert at the Royal Opera House, Covent Garden in I think 1990, by Andrew McKinnon, who organised the participation of the Australian RESIDENT singers, Suzy Johnston and me, in this fundraiser for both the AMA and Jose Carreras's Leukaemia Foundation. As we walked to the post-concert reception in the Crush Bar, I told Mr. Carreras of my family's G.F. Carden Leukaemia Research Foundation, whose funding facilitated Dr. Metcalfe's treatment which had famously saved Mr. Carreras's life. He seemed stunned by the paradox of a Carden giving her services to raise funds for HIS leukaemia foundation. All the singers and the conductor are Australian except Jose Carreras. We're singing the bubbly Drinking Song "The Brindisi" from the first act of LA TRAVIATA, at this moment all pronouncing the word "voi"! Yvonne Kenny, Jose Carreras, Joan Carden, conductor Charles Mackerras, mezzo Suzanne Johnston, and baritone Jonathan Summers.